How does LuvByNature Liposomal Vitamin C + Quercetin support optimal health? What do the experts say about vitamin C and quercetin? 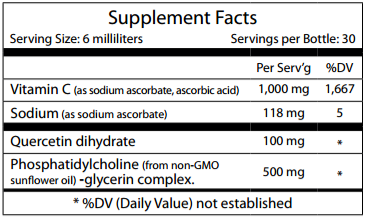 Why choose LuvByNature Vitamin C + Quercetin? • Delivers 1,000 mg of vitamin C and 100 mg of quercetin per teaspoon. • Contains 30 servings per bottle. • Most effective way to absorb vitamin C and quercetin – at the same time. 6 milliliters daily (just over one teaspoon) or as directed by your physician. Mix into water or juice for palatability. Gently shake before using and refrigerate after opening. Use within 45 days of opening. Purified water, natural plant flavors, xanthan gum, gum Arabic, potassium sorbate.